LEFT: Fig. 1a. Golconda Portrait Album for European Export in its Original Binding containing 29 Portraits, Golconda, India, ca. 1672-1674. Persian-style morocco binding, ca. 19.2 x 30.2 cm. Bibliothèque nationale de France, Paris, Smith-Lesouëf 232. Image source: BnF Gallica. CENTER: Fig. 1b. Golconda Portrait Album for European Export in its Original Binding containing 47 Portraits, Golconda, India, ca. 1672-1687. Persian-style morocco binding, ca. 18.5 x 31.8 cm. Bibliothèque nationale de France, Paris, Smith-Lesouëf 233. Image source: BnF Gallica. RIGHT: Fig. 1c. Golconda Portrait Album for European Export in its Original Binding containing 46 Portraits, Golconda, India, ca. 1672-1689. Persian-style morocco binding, ca. 18.8 x 32.2 cm. Dresden Kupferstich-Kabinett, Ca. 112. © Staatliche Kunstsammlungen Dresden. Scattered across a variety of European museums and libraries are roughly 500 painted portraits which found their way to Europe from the Deccan region of South India towards the end of the seventeenth century. These paintings portray the kings, princes and grandees associated with four dynastic kingdoms of the Indian Subcontinent—the Mughal empire, the Deccani sultanates of Bijapur and Golconda, and the Maratha polity—and the Safavid empire of Iran. Executed on individual sheets of paper with opaque watercolors and gold or silver for details in the traditional technique of Indian miniature painting, the portraits betray a remarkable stylistic uniformity and form a cohesive corpus of works. While several of them survive today as stray folios, the majority retain their organization into series, a few of which have come down to us in their original binding and may thus be referred to as albums (Figs. 1a, b, c and 2a, b, c). 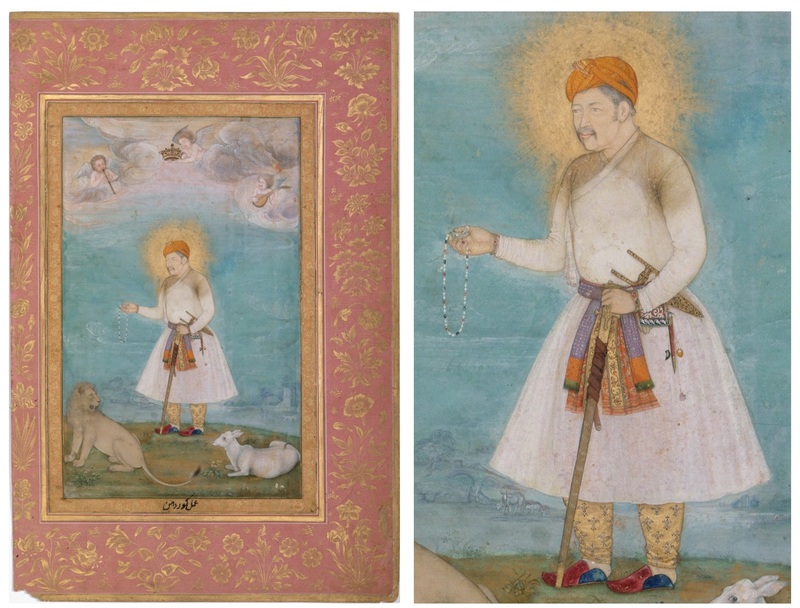 Based on their style and available written evidence, these portrait series can be assigned to the reign of the last ruler of the Golconda sultanate, Abul Hasan Qutb Shah (r. 1672-1687). Unfortunately we do not have enough information about the artists who produced them to establish whether or not they were attached to Abul Hasan’s royal atelier, but clearly they also started catering to an emerging clientele of European officers, merchants, adventurers and the like, who gravitated in and around the kingdom’s capital, Hyderabad. LEFT: Fig. 2a. 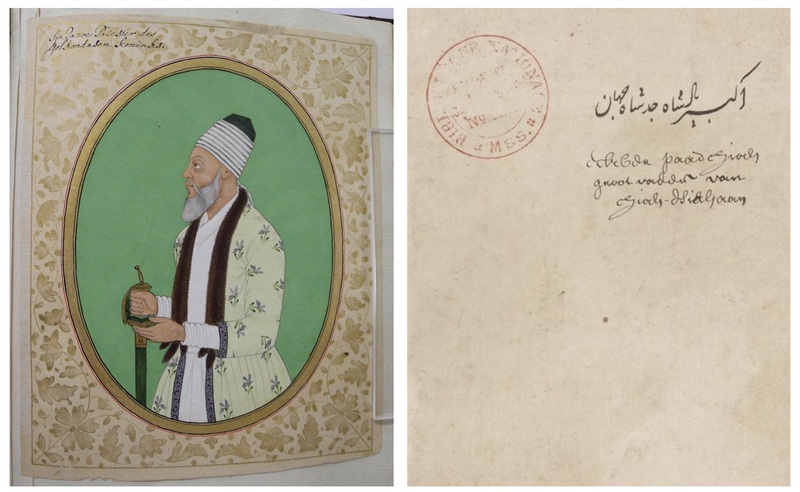 Portrait of Sayyid Muzaffar, folio from the Golconda portrait album illustrated in Fig. 1a, Golconda, India, ca. 1672-74. Opaque watercolor, ink and gold on paper, ca. 19 x 30 cm. Bibliothèque nationale de France, Paris, Smith-Lesouëf 232, f. 14v. Image source: BnF Gallica. CENTER: Fig. 2b. Portrait of Sayyid Muzaffar, folio from the Golconda portrait album illustrated in Fig. 1b, Golconda, India, ca. 1672-87. Opaque watercolor, ink and gold on paper, ca. 18.2 x 31.6 cm. Bibliothèque nationale de France, Paris, Smith-Lesouëf 233, f. 13v. Image source: BnF Gallica. RIGHT: Fig. 2c. Portrait of Sayyid Muzaffar, folio from the Golconda portrait album illustrated in Fig. 1c, Golconda, India, ca. 1672-89. Opaque watercolor, ink and gold on paper, ca. 18.5 x 32 cm. Dresden Kupferstich-Kabinett, Ca. 112, abb. 23. © Staatliche Kunstsammlungen Dresden. Over the course of the seventeenth century, Golconda emerged as a chief entrepôt for trade with the European East India companies—particularly the Dutch Vereenigde Oostindische Compagnie (VOC) and the English East India Company (EIC)—due to its richness in diamonds, indigo and saltpeter, as well as its centrality to the Indian textile trade with Southeast Asia. By the reign of Sultan Abul Hasan, European trading activities on Golconda’s Coromandel Coast had reached their peak, and the VOC’s foundation of a factory in Hyderabad in 1662 had led to the establishment of a permanent Dutch presence in the capital. The VOC factory lay in the vicinity of the Qutb Shahi palace and had a staff of Dutch officers who worked in close collaboration with local agents, interpreters and clerks. The constant exchanges between the factory and the Qutb Shahi court in matters of trade seem to have been instrumental in initiating contacts between VOC employees and artists gravitating around the royal atelier, paving the way for the emergence of a novel enterprise: the marketing to foreign clients of a type of artwork that, until then, had largely been regarded as a royal appanage. The success of this enterprise can be measured by the number of portraits that Europeans bought from artists working in Golconda during the period under consideration, surpassing by far that of existing paintings attributable to Abul Hasan’s patronage. Fig. 3. Anonymous, Emperor Jahangir with a Consort and his son Khurram, 1625. Engraving, 10.1 x 16.2 cm. From Samuel Purchas, Hakluytus Posthumus, or Purchas his Pilgrimes… (Glasgow: J. MacLehose and Sons, 1625), v. 2, p. 1474. Image in the public domain. The emergence of a European market for Golconda portrait series during the reign of Sultan Abul Hasan stands as the first full-fledged expression of an interest in portraits of India’s ruling elites that had started to manifest itself in Europe around the start of the seventeenth century. One of the earliest expressions of this interest is embodied by an engraving illustrating a compilation of European travel writings published in 1625 by the English cleric Samuel Purchas (Fig. 3). The engraving depicts the fourth Mughal emperor Jahangir (r. 1605-1627) in the company of a concubine and his son Khurram, who would succeed him on the throne as Shah Jahan. An inscription above the figures describes them as “Pictures out of the Indian Copies made by the Mogols painter,” proclaiming the derivation of their engraved likenesses from Mughal paintings, now unfortunately lost. The claim expressed by this inscription is not unusual if we read it in the context of early modern European print culture, where statements certifying the derivation of printed portraits from paintings done “ad vivum” abound. Along with such statements, the inscription encapsulates European concerns about the authenticity of portraiture as a tool of historical inquiry, hence helping us to appreciate the kind of attention and regard that locally produced portraits of Indian rulers and grandees seem to have commanded in seventeenth-century Europe. Interest in these portraits is further demonstrated by the preponderance of portraiture among the genres of Indian paintings that traveled to Europe throughout the seventeenth century. In this essay, I analyze selected specimens from the vast corpus of Golconda portrait series for European consumption datable to Abul Hasan’s reign. I focus in particular on three series, all of which retain their original binding, with a view to investigating their production, their transferal to Europe, and their subsequent adaptation to a new environment. This corpus of works has long remained understudied and hardly exhibited, having been overshadowed by the more exquisite specimens of paintings associated with India’s royal courts. Undeniably, by comparison with paintings produced under courtly patronage, the portraits studied here are artistically less accomplished, more simplified, and not as precious. But it is precisely by virtue of their qualitative distinction from royal examples that they are historically significant. The story these portraits tell is one of cross-cultural exchange and cross-fertilization within the pre-modern world. Together, they attest to the earliest systematic attempt by Indian artists to create paintings for European consumers, and therefore they make an important contribution to our understanding of early modern artistic permeability between India and Europe. Prior to this enterprise, the making of portraits of India’s royals and nobles was largely confined to courtly workshops, a circumstance that made their procurement by foreigners arduous and circumstantial. Thus, the emergence of workshops catering to a European clientele in 1670s Golconda marked a significant step towards the commodification of likenesses that were previously regarded as a royal prerogative, and towards their dissemination far beyond the boundaries of India’s royal courts. It is the modalities, motives and implications of this phenomenon that I aim to address. A close examination of the three portrait series mentioned above sheds light on the modalities of their production. 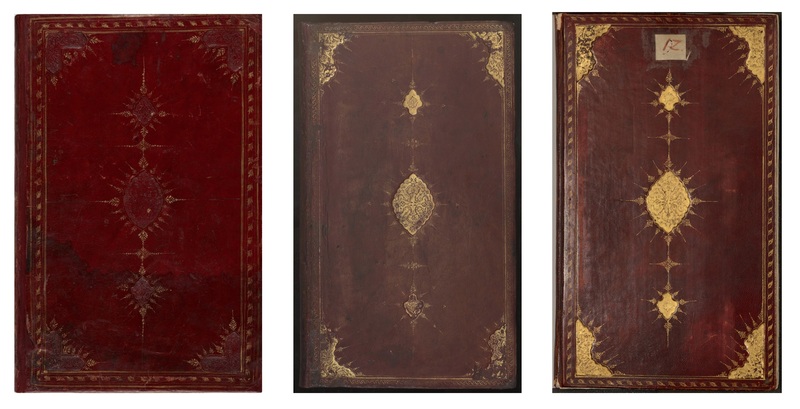 These albums, two of which are kept in the Bibliothèque nationale de France (hereafter BnF) in Paris and one in the Dresden Kupferstich-Kabinett, present a remarkably uniform look, sharing comparable dimensions, format, and a similar type of Persianate binding consisting of red morocco covers decorated with a gold-tooled design (Figs. 1a, b, c). Two of the albums also share a similar organizational layout indebted to the Persianate tradition of the muraqqa (album), with their folios assembled together so that the figures portrayed on two opposite pages face one another (Fig. 4). These albums represent precious specimens of complete Golconda portrait series for European export. Moreover, their contemporary binding contributes to their uniqueness, since the surviving corpus of Golconda portrait series consists largely of folios that are either unbound or bound into albums that seem to postdate their arrival in Europe. 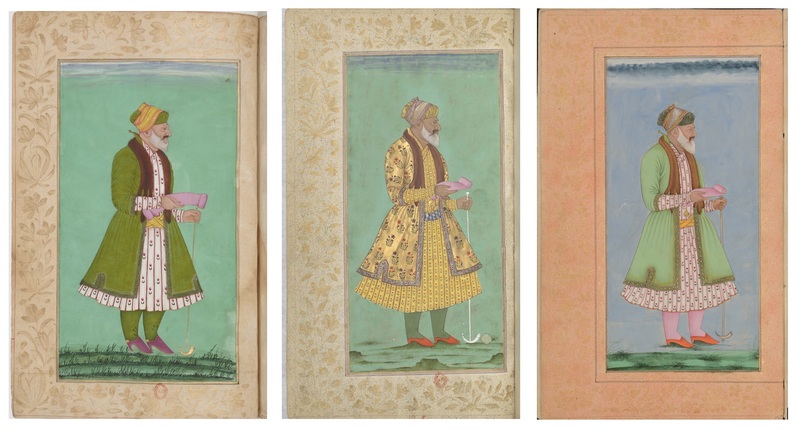 Thus, these three albums attest to the fact that Golconda portrait series were occasionally sold to Europeans in bound form, besides being available as loose sets of portraits. Fig. 4. 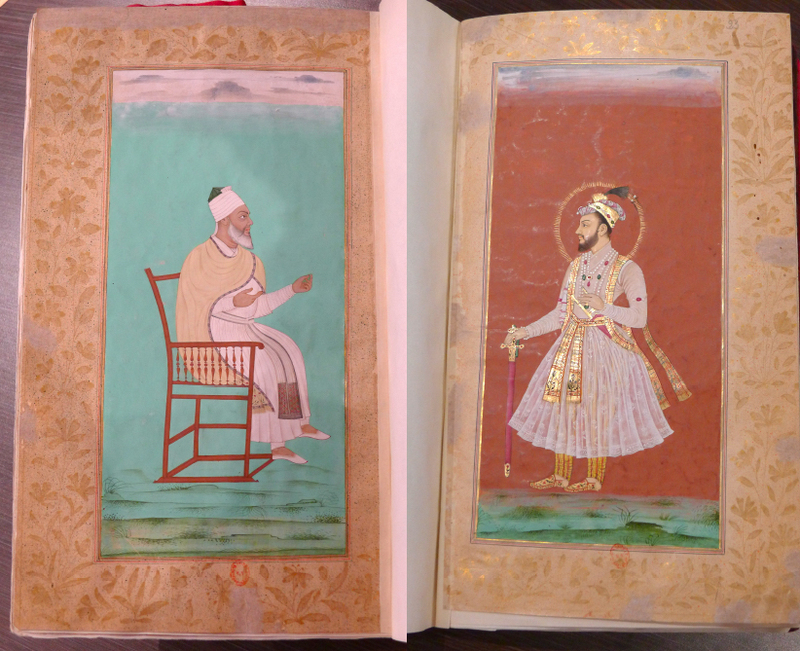 Portraits of Shah Raju (left) and Murad Bakhsh (right) displayed on two opposite pages of the Golconda portrait album illustrated in Fig. 1b, Golconda, India, ca. 1672-87. Opaque watercolor, ink and gold on paper, ca. 18.2 x 31.6 cm. Bibliothèque nationale de France, Paris, Smith-Lesouëf 233, ff. 22v-23r. Image source: BnF Gallica. Studying the content of these albums reveals further analogies. First, the repertoire of subjects portrayed in them is largely consistent, even if one contains only 29 portraits while the other two contain 46 and 47. The two larger albums feature exactly the same subjects, with the exception of two; the smaller one features 25 subjects among those found in the larger albums plus four additional ones. 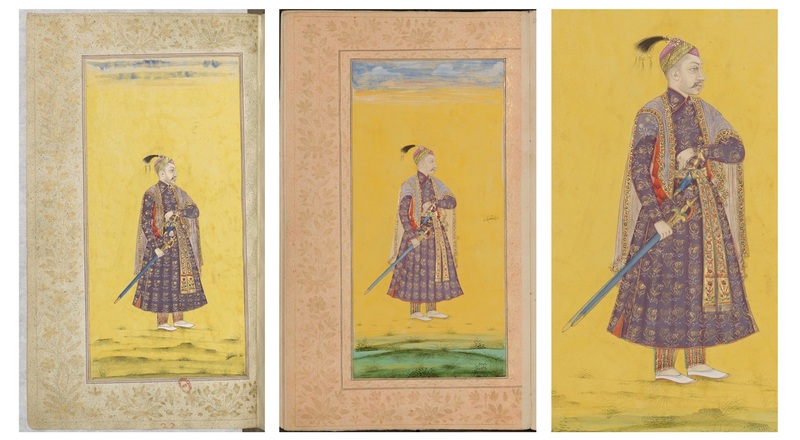 Second, the ordering of the portraits within the albums tends to follow a consistent model: each series begins with the emperors and princes of the Mughal dynasty, followed by Mughal court officials and generals. After them, we find figures associated with the Qutb Shahi dynasty of Golconda, which are followed in turn by members of the Adil Shahi dynasty of Bijapur, with the optional addition of Shivaji, the only representative of the Maratha polity. Last to appear are the Safavid kings, with which the series terminate. Fig. 5. Hashim, Sultan Muhammad Qutb Shah of Golconda, folio from an imperial Mughal album, India, ca. 1620-25. Opaque watercolor and gold on paper, 38.6 x 26.5 cm. Victoria and Albert Museum, IM.22-1925. © Victoria and Albert Museum, London. Fig. 6. Sultan Abdullah Qutb Shah, Golconda, India, ca. 1650. Opaque watercolor and gold on paper, 19 x 10 cm. Victoria and Albert Museum, IS.18-1980. © Victoria and Albert Museum, London. As regards the rendering of individual portraits in the albums, we observe a consistent approach: the figures tend to be shown standing, though they are occasionally depicted in a sitting position, and their faces are shown primarily in profile or, in some cases, in three-quarter view. Each figure is posed against a monochromatic background enlivened by a thin row of clouds at the top and a layer of grassy ground at the bottom, a formal device that lends maximum legibility to bodily and facial features (Figs. 2a, b, c). Despite presenting varying degrees of refinement, the paintings in the three albums appear noticeably standardized: they all share a homogeneous palette; comparable framing borders featuring rows of flowering plants painted in gold against a plain ground; and a high degree of similarity in the rendering of the figures. Before delving into the details and implications of this similarity, however, it is necessary to situate these paintings within contemporary artistic practices. The visual language of Golconda portrait series for European export is consistent with the pictorial tradition that flourished at the Qutb Shahi court during the second half of the seventeenth century. In particular, it betrays clear signs of a trend that shaped the trajectory of Golconda painting over the course of the century, namely the emergence of mimetic portraiture as a popular court genre, mainly due to the impact of Mughal modes of representation on the local pictorial tradition following the transformation of Golconda into a Mughal protectorate in 1636. 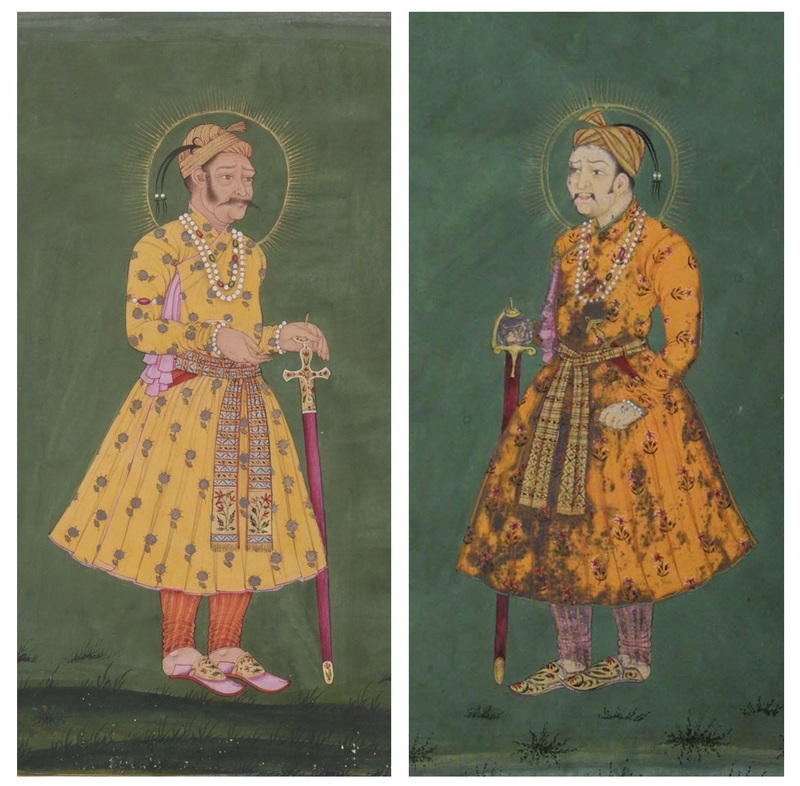 In subsequent decades, increased contacts with the Mughal court led Golconda court painters to progressively assimilate the Mughal tradition of mimetic portraiture and adapt it to local requirements. This process, which unfolded during the reign of Sultan Abdullah Qutb Shah (r. 1626-1672), might have been fostered by the latter’s acquaintance with portraits of Deccani rulers produced during the 1620s by the Mughal artist Hashim, one of which depicts Abdullah’s father and predecessor Muhammad Qutb Shah (r. 1611-1626) (Fig. 5). 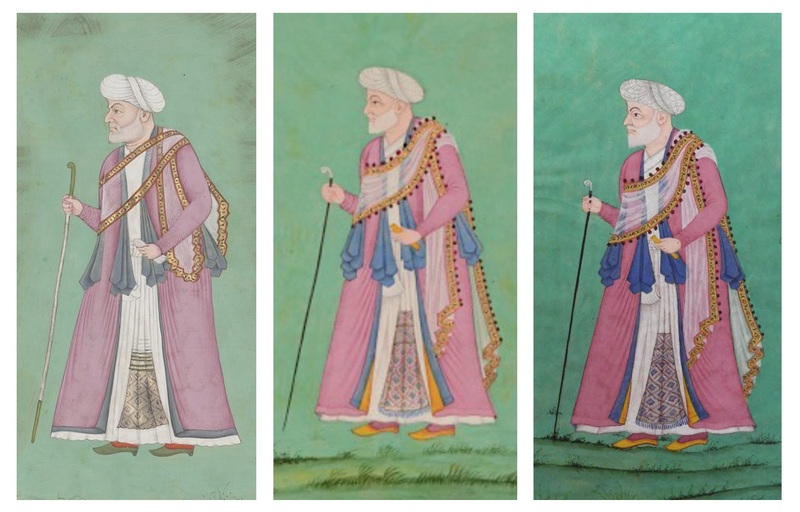 Official portraits of the Qutb Shahi sultans and noblemen started being produced at the Golconda court under the patronage of Abdullah Qutb Shah, a tradition that continued with his son and heir Abul Hasan. One example, a portrait of Abdullah Qutb Shah in the V&A dating to around 1650 (Fig. 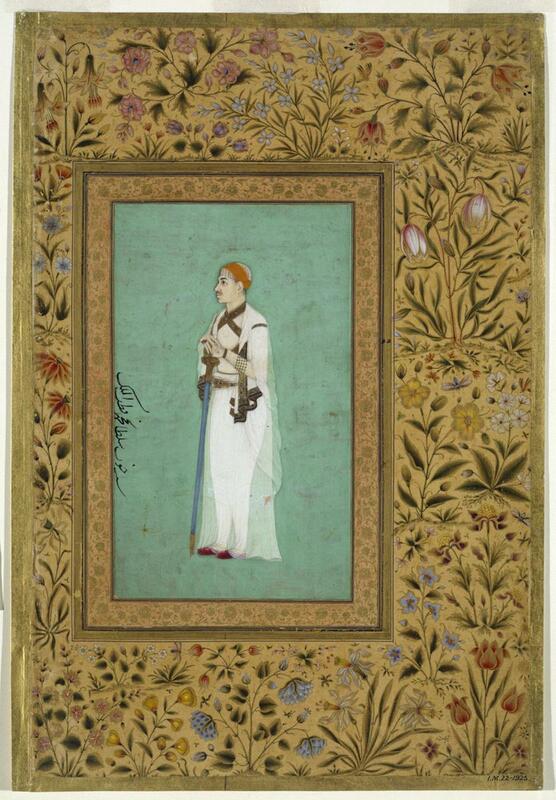 6), reveals an indebtedness to Mughal court portraiture through a comparison with Hashim’s work. The two paintings share a number of pictorial conventions, such as the placement of the subject against a plain background, the preference for a pose combining the profile view for face and legs with a three-quarter view for the torso, and the characterization of the figure by means of a detailed rendering of physiognomy and attire. Recourse to such pictorial formulas in Mughal court painting can be traced back to the reign of Emperor Akbar (r. 1556-1605) and became increasingly widespread under his successors, leading to a highly codified tradition of official portraiture. LEFT: Fig. 7a. 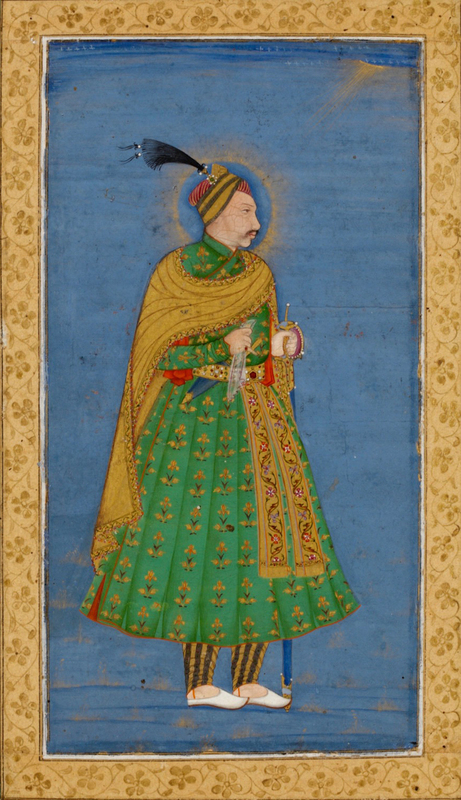 Portrait of Sultan Abdullah Qutb Shah, folio from the Golconda portrait album illustrated in Fig. 1b, Golconda, India, ca. 1672-87. Opaque watercolor, ink and gold on paper, ca. 18.2 x 31.6 cm. Bibliothèque nationale de France, Paris, Smith-Lesouëf 233, f. 14v. Image source: BnF Gallica. CENTER: Fig. 7b. Portrait of Sultan Abdullah Qutb Shah, folio from the Golconda portrait album illustrated in Fig. 1c, Golconda, India, ca. 1672-89. Opaque watercolor, ink and gold on paper, ca. 18.5 x 32 cm. Dresden Kupferstich-Kabinett, Ca. 112, abb. 25. © Staatliche Kunstsammlungen Dresden. RIGHT: Fig. 7c. Digital overlapping of the portraits illustrated in Figs. 7a and 7b. Golconda portrait series for European consumption are not only in keeping with the courtly tradition of official portraiture sponsored by the Qutb Shahi sultans (that is, bearing no significant sign of adaptation to European taste), but also betray a derivation from court paintings in regard to individual likenesses. 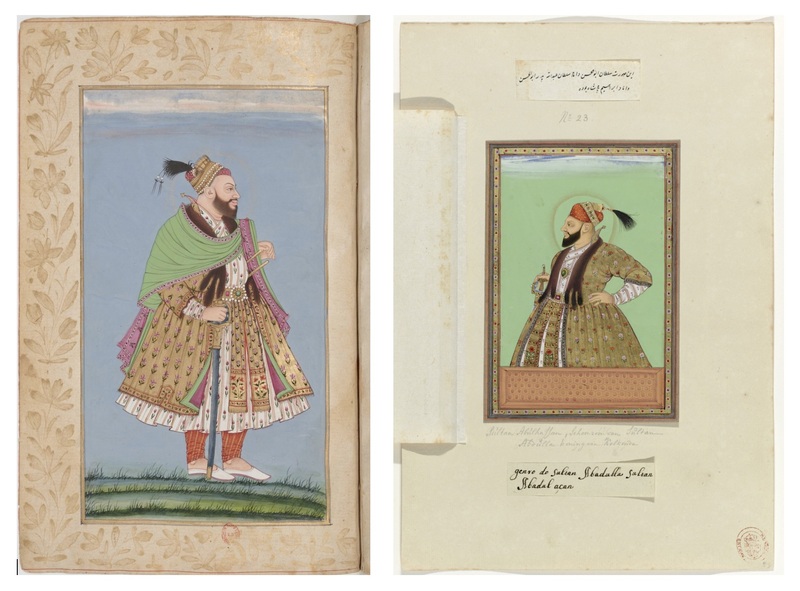 If we consider two portraits of Abdullah Qutb Shah from the BnF and Dresden albums (Figs. 7a and b), for instance, we notice, first of all, a striking resemblance between the two images and, secondly, their common derivation from previous portraits of the ruler produced under his patronage. The V&A example from around 1650 (Fig. 6) offers a good comparison to these portraits in terms of the figure’s pose, attire and attributes, as evidenced by a number of elements: the long, patterned robe tied with lappets on the right and worn over striped tight-fitting trousers; the richly embroidered sash tied around the king’s waist; the shawl wrapped around his shoulders; the pointed slippers; the long sword in his hand; and the dagger tucked into his sash. Another court painting of circa 1635 depicting Abdullah Qutb Shah on horseback (Figs. 8a and b) provides even closer parallels to our two portraits in regard to the rendering of the ruler’s facial features, turban, and diaphanous shawl. 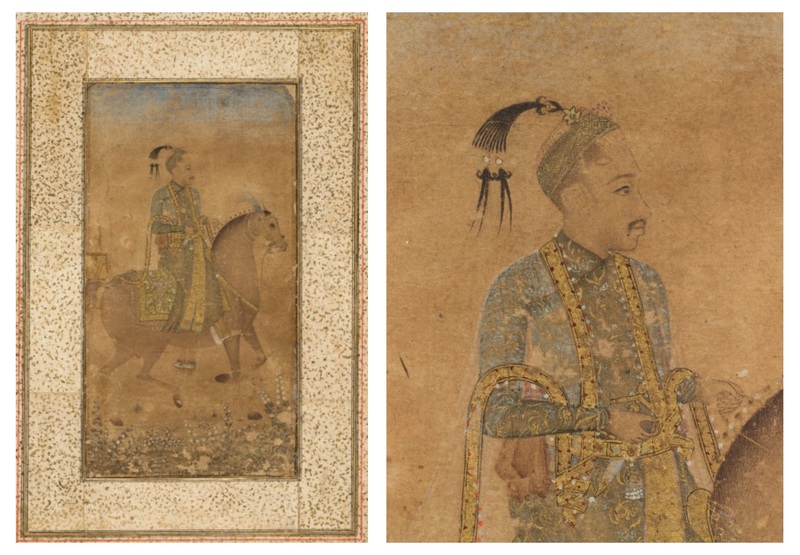 Although it is difficult to pinpoint a specific prototype for the two portraits of Abdullah Qutb Shah under consideration, it is clear that their makers relied on available court paintings as a source of templates for rendering his likeness. Besides, the fact that the two portraits are nearly identical, revealing matching outlines if overlapped (Fig. 7c), suggests that the artists used traditional methods of image reproduction, such as tracing and/or pricking and pouncing, in order to produce multiple copies of the same template to be inserted into different series. LEFT: Fig. 8a. Sultan Abdullah Qutb Shah on Horseback, Golconda, India, ca. 1635. Ink with use of watercolor and gold on paper, mounted with gold-sprinkled borders. The Cleveland Museum of Art, Gift in honor of Madeline Neves Clapp; Gift of Mrs. Henry White Cannon by exchange; Bequest of Louise T. Cooper; Leonard C. Hanna Jr. Fund; From the Catherine and Ralph Benkaim Collection, 2013.287. © The Cleveland Museum of Art. RIGHT: Fig. 8b. Detail of Fig. 8a. LEFT: Fig. 9a. Portrait of Sultan Abul Hasan Qutb Shah, folio from the Golconda portrait album illustrated in Fig. 1a, Golconda, India, ca. 1672-74. Opaque watercolor, ink and gold on paper, ca. 19 x 30 cm. Bibliothèque nationale de France, Paris, Smith-Lesouëf 232, f. 18v. Image source: BnF Gallica. RIGHT: Fig. 9b. Portrait of Sultan Abul Hasan Qutb Shah, folio from the Witsen album, Golconda, India, ca. 1677-82. Opaque watercolor, ink and gold on paper, mounted on a white folio, ca. 12 x 19 cm. Rijksprentenkabinet, RP-T-00-3186, f. 23. © Rijksmuseum, Amsterdam. Fig. 10. Portrait of Sultan Abul Hasan Qutb Shah Standing, Golconda, India, ca. 1675. Opaque watercolor and gold on paper, 22.1 x 14.45 cm. San Diego Museum of Art, 1990.491. © San Diego Museum of Art, Edwin Binney 3rd Collection. The above suggestion is confirmed by a broader analysis of the surviving corpus of Golconda portrait series, which reveals corresponding outlines for various other subjects of portraiture, such as Sayyid Muzaffar (Figs. 2a, b, c), Shaikh Muhammad Khatun (Figs. 11a, b, c), and Emperor Akbar (Figs. 13a and b). Most of the portraits in these series conform to a single template, which was occasionally reproduced in reverse, as illustrated by the two portraits of Akbar, or slightly varied through minimal changes in the posture and attributes of the figure. Comparing different portraits of the same subject is also revelatory of a marked tendency towards standardization in the rendering of attire, whose replication was often so careful as to maintain the same color schemes. The largely unvarying look of portraits from different series seems to hint at an awareness on the part of their makers of early modern interpretations of clothing as an integral part of someone’s social persona, and thus as an essential element of portraiture. Indeed, one notices in the figures an overall treatment of dress as an extension of the body and as a signifier of status. For instance, portraits of Abul Hasan (Figs. 9a and b) reveal a particular attentiveness to items of the sultan’s traditional apparel, notably his fur wrap and golden coat with pointed collar, which pay tribute to the Central Asian fashions of the Turkman founders of his dynasty. These portraits were evidently modeled on one of the various likenesses of Abul Hasan produced at his court where he appears similarly attired, such as a painting datable to circa 1675 (Fig. 10). By comparison, non-royal subjects within Golconda portrait series tend to display less ostentatious clothing. For example, Shaikh Muhammad Ibn Khatun, who served as prime minister of Sultan Abdullah Qutb Shah, is consistently shown wearing a long, open coat on top of a simple white robe and a transparent white shawl wrapped across the chest (Figs. 11a, b, c), clothing that matches closely his appearance in a Golconda court painting of circa 1630 (Figs. 12a and b). These examples show that the makers of Golconda portrait series paid equal attention to the depiction of physiognomical features and dress when replicating royal prototypes. LEFT: Fig. 11a. Portrait of Shaikh Muhammad Khatun, detail of folio from the Golconda portrait album illustrated in Fig. 1b, Golconda, India, ca. 1672-87. Opaque watercolor, ink and gold on paper, ca. 18.2 x 31.6 cm (entire folio). Bibliothèque nationale de France, Paris, Smith-Lesouëf 233, f. 15r. Image source: BnF Gallica. CENTER: Fig. 11b. Portrait of Shaikh Muhammad Khatun, detail of folio from the Golconda portrait album illustrated in Fig. 1c, Golconda, India, ca. 1672-89. Opaque watercolor, ink and gold on paper, ca. 18.5 x 32 cm (entire folio). Dresden Kupferstich-Kabinett, Ca. 112, abb. 26. © Staatliche Kunstsammlungen Dresden. RIGHT: Fig. 11c. Portrait of Shaikh Muhammad Khatun, detail of folio from a Golconda portrait series owned by Sir Hans Sloane, Golconda, India, ca. 1672-87. Opaque watercolor, ink and gold on paper, 11.1 x 23.9 cm (entire painting). British Museum, London, 1974,0617,0.2.34. Image courtesy of British Museum, CC BY-NC-SA 4.0. LEFT: Fig. 12a. Darbar of Sultan Abdullah Qutb Shah, Golconda, India, ca. 1630. Opaque watercolor, ink and gold on paper, 15.5 x 25 cm. British Museum, London, 1937,0410,0.1. Image courtesy of British Museum, CC BY-NC-SA 4.0. RIGHT: Fig. 12b. Detail of Fig. 12a showing Shaikh Muhammad Khatun, Sultan Abdullah Qutb Shah’s prime minister. Because of their derivation from such prototypes, Golconda portrait series tend to offer a static, condensed glance at the political scenario of late seventeenth-century India, a tendency which may be related to their particular context of production. The fact that most of the portraits within these series adhere to a single template may result from the limited availability of tracings of official court portraits to their makers. This is especially true of the portraits of figures associated with dynasties other than the Golconda sultanate, whose creation appears to have required access to tracings of paintings produced at other Indian courts. Although the identification of courtly prototypes for each of the numerous likenesses featured in Golconda portrait series is a lengthy, ongoing process, my research suggests that the portraits of figures associated with the Mughal and Bijapur dynasties were derived from paintings produced at their respective courts. Miniatures from the Mughal and Bijapur courts are known to have circulated in Golconda, largely in the form of tracings, as a result of the mobility of Mughal and Bijapuri artists within the Deccan region. This circulation may account, for instance, for the fact that portraits of Akbar from surviving Golconda series (Figs. 13a and b) betray a common derivation from a posthumous likeness of the emperor that gained diffusion in Mughal court painting during the 1630s and that is known to have been replicated through tracing (Figs. 14a and b). The fact that most of the portraits from these series are of subjects attached to the Golconda dynasty also implies the use of tracings, since artists based in Golconda would obviously have had easier access to locally produced portraits than to portraits painted at other courts. LEFT: Fig. 13a. Portrait of Akbar, detail of folio from the Golconda portrait album illustrated in Fig. 1a, Golconda, India, ca. 1672-74. Opaque watercolor, ink and gold on paper, ca. 19 x 30 cm (entire folio). Bibliothèque nationale de France, Paris, Smith-Lesouëf 232, f. 1v. Image source: BnF Gallica. RIGHT: Fig. 13b. Portrait of Akbar, detail of folio from a Golconda portrait series owned by Sir Hans Sloane, Golconda, India, ca. 1672-87. Opaque watercolor, ink and gold on paper, 11.1 x 24 cm (entire painting). British Museum, London, 1974,0617,0.2.13. Image courtesy of British Museum, CC BY-NC-SA 4.0. LEFT: Fig. 14a. Govardhan, Akbar with Lion and Calf, folio from the Shah Jahan album, Mughal India, ca. 1630. Opaque watercolor, ink and gold on paper, 25.7 x 38.9 cm. The Metropolitan Museum of Art, New York, 55.121.10.22, Purchase, Rogers Fund and The Kevorkian Foundation Gift, 1955. Image courtesy of the Metropolitan Museum of Art. RIGHT: Fig. 14b. Detail of Fig. 14a. To summarize, the standardized appearance of Golconda portrait series for European export appears as a direct result of their makers’ reliance on traditional methods of image reproduction to render the individual likenesses displayed therein. Yet, there seems to be more to it than this. 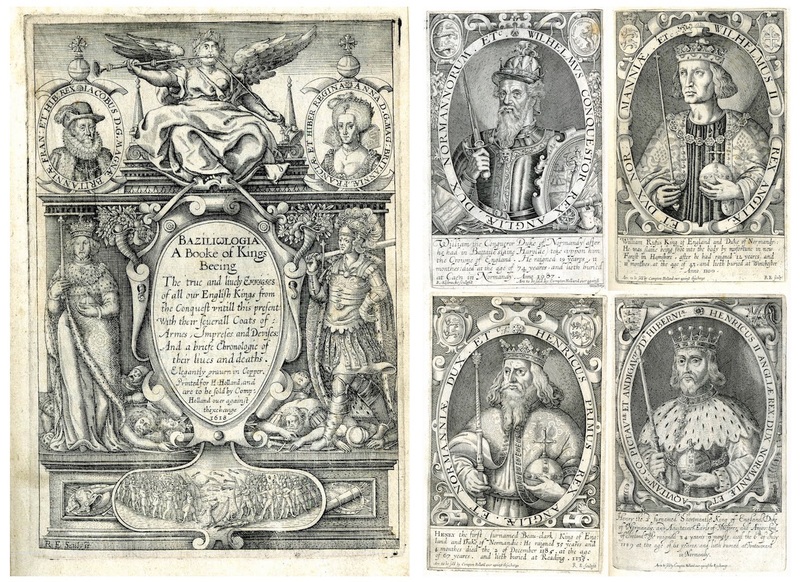 As I argue in the next sections, the derivation of these likenesses from royal portraits, their replication through the use of tracings, and their coherent serial organization also helped ensure their successful reception in early modern Europe. Tracking the transition of Golconda portrait series from their context of production to that of the wunderkammern, the “cabinets of curiosities” they came to inhabit in Europe, is not a straightforward task. Very few written sources document the various transactions that this process must have entailed. In reconstructing the portraits’ journeys, there are two main forms of evidence we can rely on: the inscriptions identifying the portrayed subjects within some of the surviving series (to which I will return later); and other documents, such as collection inventories and letters, through which we can trace some of the series to their original owners. The outcomes of my study of these written sources can be summarized as follows. First, the identifiable owners of Golconda portrait series in Europe at the turn of the eighteenth century formed a homogeneous class of collectors with a shared socio-economic and cultural background. All of them belonged to the urban elite and participated in the pan-European Republic of Letters, a compact network of scholars and learned individuals who shared a humanistic ideal of universal knowledge and conducted extensive exchanges with one another. In addition, most of these individuals occupied positions of prestige in their respective societies, which allowed them to benefit from an extensive network of international informants across Europe and Asia. This leads to my second finding. There is evidence that the acquisition of Golconda albums by European collectors depended heavily on the mediating role of merchants and travelers who acted as agents in procuring these series, as well as on the sustained network of private correspondence that linked members of the Republic of Letters. More specifically, the available data points to the centrality of Dutch networks in facilitating the arrival of these series and their dissemination among private collections across Europe. contains 47 miniature portraits of Mughal princes, gathered in the voyage that the Dutch painter Claude Le Bruyn made to Iran and the East Indies in 1690. Witsen, the burgomaster of Amsterdam, had all the above-mentioned portraits copied, and I myself saw the copies in his house in 1714. Nicholaas Witsen (1641-1717) was a renowned collector who, from 1693, also served as director of the VOC. His extensive wunderkammer comprised natural and man-made objects from all parts of the known world, including a Golconda portrait series of 49 portraits (the so-called “Witsen album” currently preserved in the Rijksprentenkabinet, Amsterdam) and many other Indian miniatures. Witsen had at his disposal a wide network of international agents on whom he relied to obtain written reports and different kinds of artifacts from Asia, both for himself and for other collectors. Among his agents was the Dutch artist-traveler Cornelis de Bruijn (1652-1726/7), doubtless the “Claude Le Bruyn” mentioned in Baldini’s colophon. Witsen is known to have supported de Bruijn’s extensive travels to Asia so as to benefit from the artist’s first-hand drawings and notations as well as from his ability to procure artifacts. Upon returning to Europe from Asia in 1709, de Bruijn set up a cabinet in Amsterdam to display the curiosities he collected during his travels and sell them to potential buyers. Let us now return to Baldini. According to his friend and biographer Ubertino Landi, Baldini was a man of broad interests who developed a passion for collecting during his sojourn in the Netherlands in 1712-1715 to attend the Congress of Utrecht. During these years, as the above colophon confirms, Baldini met Witsen and, as Landi tells us, “applied himself entirely to putting together his remarkable Museum of Indian and Chinese things,” which Baldini established at his residence in Piacenza upon his return to Italy. This museum, whose contents are well documented thanks to a detailed catalogue published in 1722 by Antonio Vallisnieri, stands as a remarkable example of an early eighteenth-century European collection with a specific focus on Orientalia. Vallisnieri’s catalogue lists six different series of portraits of Indian kings and grandees, each described in a separate entry, one of which is identifiable as the album in the BnF. The evidence laid out above suggests that Baldini was inspired to acquire these portrait series after seeing similar items in Witsen’s collection and that Witsen likely assisted him by mediating between Baldini and de Bruijn. Given the prestige of Witsen’s collection, it is plausible that Baldini aimed to emulate it in his own museum, especially when we consider that emulation played a significant role in shaping social status as well as collecting practices at the time. But why were collectors such as Witsen and Baldini interested in Golconda portrait series among the myriad objects that flowed to Amsterdam from the East? What made them desirable possessions? LEFT: Fig. 15a. Oval Bust Portrait of Shah Raju, folio from a Golconda portrait album for European export containing 26 portraits, Golconda, India, ca. 1680-85. Opaque watercolor, ink and gold on paper, ca. 12 x 14.5 cm. British Museum, London, 1974,0617,0.11.22. Image courtesy of British Museum, CC BY-NC-SA 4.0. RIGHT: Fig. 15b. Double Inscription in Persian and Dutch facing a Portrait of Akbar, detail of folio from the Golconda portrait album illustrated in Fig. 1a, Golconda, India, ca. 1672-74. Bibliothèque nationale de France, Paris, Smith-Lesouëf 232, f. 2r. Image source: BnF Gallica. To answer these questions, we must explore how owners used and engaged with these series. Although the available data points to the adaptability of these series to encompass a variety of functions, from repositories of information to showpieces and artworks for display, here I will limit myself to discuss their best documented use as instruments of knowledge. As I mentioned above, some of the surviving series present inscriptions identifying the subjects portrayed therein. In most cases, these inscriptions are in Persian and appear near the figure they name (Figs. 2c, 7b). But occasionally we also find inscriptions in European languages, Dutch being the most frequent (Figs. 15a and b), followed by Portuguese (Fig. 9b). These inscriptions have been interpreted as the work of European employees of the VOC factory in Golconda who either knew Persian (the language of the local government) or collaborated with local employees in producing translations of available Persian captions. This supposition is confirmed by an entry from Baldini’s museum catalogue, which describes the portraits in one of his series as “inscribed with explanatory notes on the verso by those who carried them to Europe.” The fact that such “explanatory notes” were deemed useful additions hints that these series appealed to contemporary European collectors largely because of their informative potential. Indeed, the collections of Witsen and Baldini offer clear proof of the employment of Golconda portrait series as tools of historical inquiry that lent a visual dimension to accounts and reports on Indian history and polities. The Witsen album, for instance, comprises among its contents a handwritten list with transcriptions and translations into Dutch of the biographical captions in Persian accompanying each of its portraits (see Fig. 9b), along with another sheet of paper inscribed with further notations about selected portrait subjects. Both documents were produced at Witsen’s request by Hendrik Francken, one of his acquaintances with a knowledge of Persian, a fact that fits into Witsen’s practice of commissioning translations of the Oriental books in his collection which he deemed important for his studies. [Baldini] set himself with inexpressible intensity of study and incessant labor to compare what he read with what he saw, and made such progress by confronting printed relations with actual objects that in the manuscripts he has left he was able to point out the mistakes into which travelers have as usual fallen […]. The relevance of Golconda portrait series as sources of historical inquiry in the eyes of the European intellectual elite of the time can broadly be explained in terms of the ongoing interest in the dynastic history of foreign countries. This interest was spurred by the “expansion of the geographical and chronological scope of history” brought about by voyages of discovery. But there also seems to have been a more practical relevance to these portrait series. If we consider the weight of Indian political affairs in affecting the outcome of European commercial ventures in the East and the resulting concern for documentation on the part of the East India companies as a means to advance their profits, we may come to regard the emergence of a European market for Golconda portrait series as a direct result of the VOC’s proto-ethnographic approach to Indian politics. The repertoire of figures depicted in these series, in fact, focuses largely on the protagonists of contemporary political developments affecting the Deccan region and involving relations between the Mughal empire, the Deccani kingdoms, and the rising power of the Marathas. Some of these figures directly influenced European trade on the Coromandel Coast, whose prosperity depended on good diplomatic relations with the local administration. For instance, Golconda’s prime minister Madanna (d. 1685) and the Maratha chief Shivaji (d. 1680), both of whom are prominently represented within extant series, were instrumental to the VOC’s ascendancy in the region vis-à-vis other European companies as a result of their negotiations with Dutch authorities. In a context where the VOC is known to have actively promoted the compilation of records supplying biographical and other information about key figures in the political scenario of seventeenth-century India, the fact that Golconda portrait series started being eyed as collectibles says much about their perceived credibility to supplement written sources. In this regard, it is also telling that selected portraits from these series were chosen as models for engravings to be used as illustrations within two major Dutch accounts of the VOC’s enterprise in Asia. The authors of both accounts had spent years serving the VOC in the Dutch East Indies and had made specific efforts to obtain painted portraits of Indian rulers and grandees to be reproduced in print within their works. Their efforts demonstrate that the informative value of such portraits was acknowledged and exploited not only by erudite collectors from the Republic of Letters, but also by individuals who were directly involved in the European program of commercial expansion. In the following section I advance some interpretations that may further clarify the appreciation of Golconda portrait series among these European circles by discussing the process of cultural redefinition they underwent after their arrival in Europe. LEFT: Fig. 16a. Renold Elstrack, Title-Page of Braziliologia, A Booke of Kings, Being the True and Lively Effigies of all our English Kings from the Conquest untill this present… (London, 1618). Engraving, 13.1 x 19 cm. British Museum, London, L.77.1. Image courtesy of British Museum, CC BY-NC-SA 4.0. RIGHT: Fig. 16b. Renold Elstrack, Oval Bust Portraits of William the Conqueror Duke of Normandy, William Rufus King of England, Henry I, and Henry II, from Braziliologia, 1618. Engraving, ca. 11.2 x 18 cm. Men are often curious to detect in portraits those virtues which they have heard celebrated and exalted in great [men] by their fame among living people and by writers […], hence […] it is much befitting to the study of History to have in front of our eyes the images of those of whom we read the illustrious exploits. So that, seeing that the exploits often do not correspond to the faces, and that sometimes the most beautiful faces hide the most horrible thoughts, the Reader […] may contemplate the miracles that Nature can play regarding human likenesses. Fig. 17. 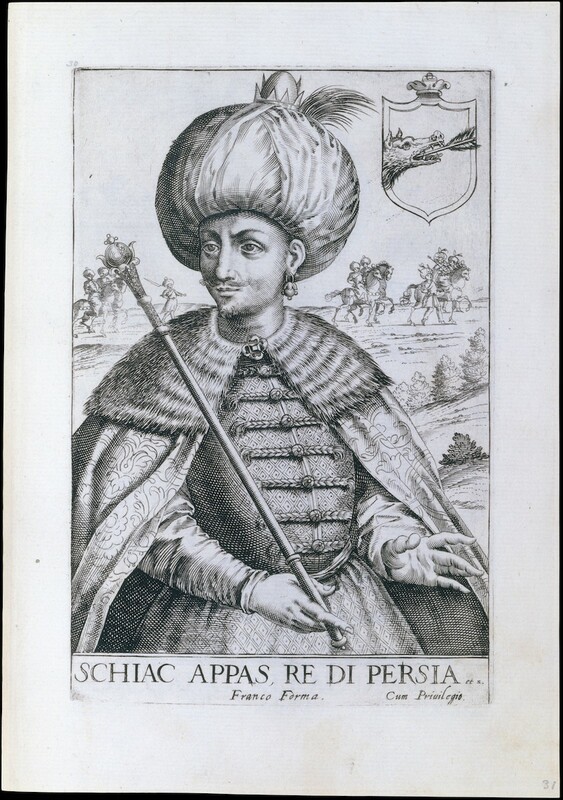 Giacomo Franco, Portrait of Shah Abbas King of Persia, from Effigie Naturali dei Maggior Prencipi et Più Valorosi Capitani di Questa Età con l’Armi Loro… (Venezia, 1596). Engraving, 21 x 30.4 cm. The Metropolitan Museum of Art, New York, 57.506, The Elisha Whittelsey Fund, 1957. Image courtesy of the Metropolitan Museum of Art. As portrait-books and portrait-albums came to function as tools for testing the validity of physiognomical theories, ensuring the authenticity of portraits emerged as a matter of utmost importance. Thus, it became common for authors and publishers to make insistent claims about the veracity of the likenesses contained in their books, either by proclaiming their derivation from specific sources (in the form of statues, paintings, medals, and the like), or by leaving the frames for portraits of certain figures empty so as to signify the unavailability of genuine likenesses and thus prove the rigor of their own approach. Phrases such as “true portraits faithfully derived from the originals” are a constant refrain in the context of Renaissance printed portraits, reiterating the crucial importance attached to processes of copy and replication in ensuring the authenticity of portraiture. The above scenario is highly relevant for understanding the reception of Golconda portrait series in early modern Europe, as it elucidates how these works might have been interpreted according to local categories of thought and made to answer current expectations with regard to portraiture. As I proceed to explain, the visual vocabulary of these series seems to have facilitated their reception in Europe through its multiple points of contact with the local existing genres of the portrait-book and portrait-album. First of all, the informative clarity of Golconda portrait series (e.g. through the adoption of full or three-quarter profiles, the use of monochromatic backgrounds, and the linear rendering of physiognomic details) expresses the same concern for legibility as European printed portraits that responded to physiognomic doctrines encouraging close scrutiny of the face. Second, the standardized appearance of the portraits within Golconda series appears to have played an authenticating role, by proclaiming their derivation from royal prototypes. This hypothesis is confirmed by a valuable passage from the catalogue to Baldini’s collection, in which Vallisnieri, after describing three different portrait series, states: “The physiognomies of the images in these three series resemble each other so much that they can clearly be understood as not to be fake, but rather as coming from the original.” His statement supports the idea that the repetitive look of Golconda portrait series was understood to confer validity, just as the derivative nature of printed effigies in European portrait-books called attention to the models used in their production. Third, Golconda portrait series are comparable to European portrait-books and portrait-albums in terms of their layout, emphasizing seriality and the juxtaposition of word and image. As we have seen, the internal organization of surviving series reveals a tendency to emphasize the place of individual subjects within their respective dynastic line, a feature that presents clear analogies to the ordered, chronological arrangement of portrait-books and portrait-albums. Moreover, the repetitive monotony of Golconda portrait series, accentuated by their uniformity of frames and border designs, finds a parallel in the standardized seriality of these European printed genres, which served to encourage and facilitate comparisons between subsequent portraits. Finally, the fact that some Golconda portrait series were supplied with captions identifying each of the figures makes them further akin to printed portrait-albums. TOP: Fig. 18a. Venetian Gentlemen and Patricians, from Jean Jacques Boissard, Habitus Variarum Orbis Gentium (Costumes of the Various Peoples of the World) (Mechelen, 1581). Engraving, oblong folio. Bibliothèque nationale de France, Paris, 4-OB-25, f. 7. Image source: BnF Gallica. BOTTOM: Fig. 18b. Mufti / Seigneur de la Barbarie / Turc, from Boissard, Habitus Variarum Orbis Gentium, 1581. Engraving, oblong folio. Bibliothèque nationale de France, Paris, 4-OB-25, f. 62. Image source: BnF Gallica. There is also a third printed genre that appears to have contributed to the successful reception of Golconda portrait series in early modern Europe: the costume book. This genre, which emerged at the same time as those previously discussed, aimed to document the regional attires of different classes of people, addressing European concerns with the mapping of fashions from around the known world (Figs. 18a and b). Costume books employed similar strategies to portrait-books and portrait-albums: the labeling of the figures with captions explaining their identity and provenance; their sequential ordering according to social class and geographical location; and the repetitive format of each print facilitating a comparative approach. But while portrait-books and portrait-albums placed the focus of attention on the face, costume books emphasized dress as the locus of identity. This was in adherence with the widespread notion that clothing could function as a second skin and “indicate the character of people,” as argued by the Renaissance scholar Francesco Sansovino. In the context of early modern Europe’s global expansion, this meant that dress was treated as an important marker of cultural difference and royal fashions as emblematic of different systems of government. As argued above, Golconda portrait series show a marked concern for accuracy and attention to details in the rendering of attire, which betrays an understanding of clothing as a signifier of dynastic affiliation, social rank, and faith. Such an attentive depiction of Eastern fashions must surely have enhanced their appeal for contemporary Europeans. Indeed, the two visual foci of these portrait series—the face and the costume of the sitters—would have been understood as two inseparable aspects of the sitter’s persona. Thus, I would argue that the appreciation of Golconda portrait series in early modern Europe rested on their ability to meet the demands with which the existing local genres of the portrait-book, portrait-album and costume book were invested. These series came to be understood as valuable possessions because they presented Europeans with a set of visual elements that allowed for multiple approaches, simultaneously serving the interlinked tasks of historical inquiry, physiognomical evaluation, and geographical classification. I would also argue that the parallels between Golconda portrait series and the above-described European printed genres are evidence of the existence of a shared system of values attributed to historical portraiture between Europe and the Indian subcontinent. If we take a step back into the environment in which these series were produced, we are met with a whole set of notions about portraiture that share strong resonances with contemporaneous European approaches to the genre. First, the documentary scope of portraiture was widely acknowledged in seventeenth-century India, as attested by the patronage of mimetic likenesses both at the Mughal and Deccani courts. Second, portraiture was assigned a major role in dynastic historiography, and illustrated genealogies were commissioned by Mughal emperors as well as Deccani sultans as a way to legitimize their rule. 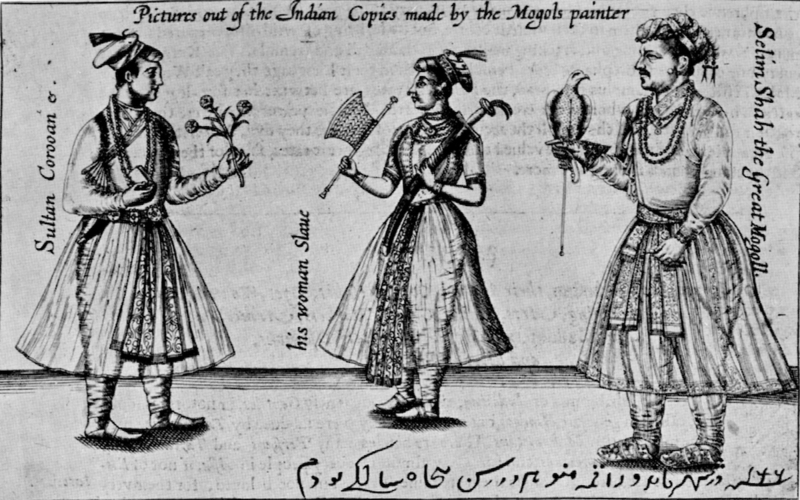 Third, there seems to have been a similar understanding of the authenticating power of the copy in seventeenth-century India, as demonstrated by the extensive use within local pictorial traditions of tracings of portraits done “ad vivum” for replicating the likenesses of royals and nobles. Finally, likenesses of foreigners are known to have exerted a certain fascination among Indian ruling elites, as demonstrated by the quest for portraits of Safavid and European kings and grandees at the Mughal court. In this respect, the ornamentation of the royal darbar of Emperor Jahangir with “pictures of the King of England, the Queene […] Elizabeth, the Countess[s] of Sommersett and Salisbury, and of a Cittizens wife of London,” as described by a British ambassador in 1616, offers an insightful parallel to the portrait galleries of contemporary Europe, demonstrating a similar recourse to effigies of foreigners to lend local milieus an aura of universality. These commonalities point to a closely interlinked pre-modern cultural geography between Europe and India, in which the Islamic world, though widely diverse, functioned as an important zone of connectivity for the circulation of ideas between East and West. 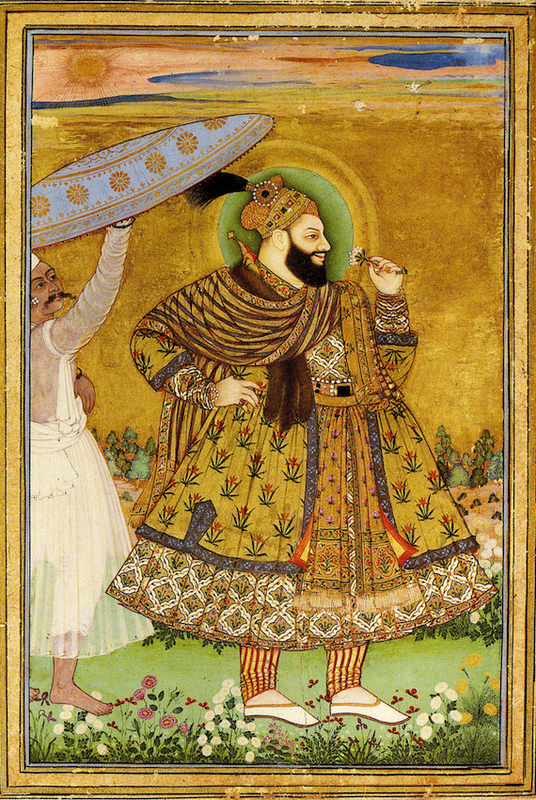 Recent comparative studies of different traditions of imperial portraiture at the major early modern Muslim courts have highlighted common grounds of localized responses to portraiture, particularly regarding the relationship between original and copy (whose roots have been traced to a myth about the origin of portraiture recounted in a Safavid album of 1544-1545) and the understanding of portraiture as an important element of genealogical history. 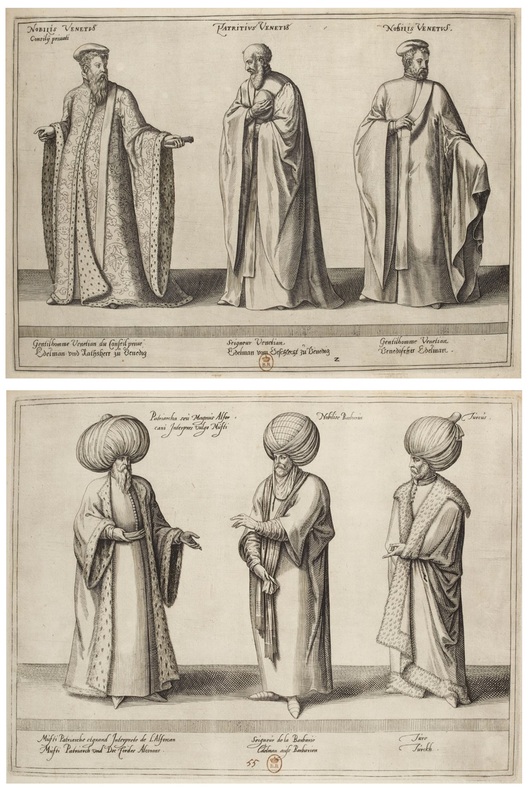 Likewise, a recent article by art historian Emine Fetvacı has called attention to the shared European and Islamic notions of physiognomy, portraiture and historiography, which facilitated the reception of European printed portrait-books at the Ottoman court and their “translation” into a local court genre. The importance, when dealing with phenomena of cross-cultural transmission, of directing our attention not to the “roots” of determinate forms of cultural production, but rather to their entangled “routes,” that is, the dynamics of transcultural contact through which these forms were adapted to different local environments, have been signaled by the anthropologist James Clifford and applied more recently by art historians. I believe that the corpus of Golconda portrait series discussed in this essay can lend further support to this theoretical approach, especially once more information is brought to light through additional research. As artifacts that claimed authenticity through their unmistakably Indian style, while at the same time asserting their global relevance through a visual format that bypassed cultural boundaries, these portrait series may be regarded as having played an active role in forging intercultural connections in the course of their travels. As such, they not only have the potential to shed light on the formative stages of European engagement with Indian art, but also to invigorate arguments about the multidirectionality of artistic flows across early modern Eurasia. For an annotated list of all the Golconda portrait series for European export that I was able to locate in the course of my research, as well as a more in-depth discussion of these works, see Marta Becherini, “Staging the Foreign: Niccolò Manucci (1638-ca. 1720) and Early Modern European Collections of Indian Paintings” (Ph.D. dissertation, Columbia University, 2017). Important indicators for the dating of these series are the biographical captions accompanying some of the portraits. See Becherini, “Staging the Foreign,” 184-188, 598-601. The three main publications to date focusing on Golconda portrait series for European export include some interpretations about their attribution. See Hermann Goetz, “Notes on a Collection of Historical Portraits from Golconda,” Indian Arts and Letters 10:1 (1936), 10-21; Madeleine Perriot, “Une série de portraits Deccani: la collection d’art indien du Président de Robien au Musée de Rennes,” Revue du Louvre 5:6 (1987), 379-388; and Pauline Lunsingh Scheurleer, “Het Witsenalbum: Zeventiende-eeuwse Indiase Portretten op Bestelling,” Bulletin van het Rijksmuseum 44:3 (1996), 167-254. Om Prakash, European Commercial Enterprise in Pre-Colonial India (Cambridge: Cambridge University Press, 1998), 175-210. Sinnappah Arasaratnam, Merchants, Companies and Commerce on the Coromandel Coast, 1650-1740 (Delhi: Oxford University Press, 1986), 69; Scheurleer, “Het Witsenalbum,” 199. Despite Abul Hasan’s renown as a generous patron of the arts, which is echoed in his nickname Tana Shah (“King of Taste”), few paintings can securely be attributed to his court. See George Michell and Mark Zebrowski, Architecture and Art of the Deccan Sultanates (Cambridge: Cambridge University Press, 1999), 202. Samuel Purchas, Hakluytus Posthumus, or Purchas his Pilgrimes: Contayning a history of the world in sea voyages and lande travells by Englishmen and others (Glasgow: J. MacLehose and Sons, 1625), v. 2, 1474. One of the two Mughal miniatures used in the production of this engraving was painted in Mandu by the Mughal artist Manohar, as attested by the Persian inscription in Jahangir’s autograph reproduced at the bottom of the engraving. It reads: “The year 1026  in the town of Mandu. Painted by Manohar. I was in my fiftieth year.” Arthur Mayger Hind, Engraving in England in the Sixteenth & Seventeenth Centuries: A Descriptive Catalogue with Introductions (Cambridge: Cambridge University Press, 1952-64), v. 2, 388. See Cecil H. Clough, “Italian Renaissance Portraiture and Printed Portrait-Books,” in Denis V. Reidy, ed., The Italian Book 1465-1800: Studies Presented to Dennis E. Rhodes on his 70th Birthday (London: British Library, 1993), 186-199. See fn. 3. Most recently a few of these works were included in an exhibition organized by the Staatliche Kunstsammlungen Dresden and published in its accompanying catalogue: Indian Paintings: The Collection of the Dresden Kupferstich-Kabinett (Dresden: Sandstein Verlag, 2017). Due to their status as royal paintings, Mughal portraits had limited circulation outside the imperial court, and their occasional arrival in Europe was largely restricted to episodes of gift exchange. See Sanjay Subrahmanyam, “A Roomful of Mirrors: The Artful Embrace of Mughals and Franks, 1550-1700,” Ars Orientalis 39 (2010), 56-57; Becherini, “Staging the Foreign,” 165-170. Bibliothèque nationale de France (BnF), Département des Manuscrits, Smith-Lesouëf 232 and 233; Dresden Kupferstich-Kabinett, Ca. 112. The first two albums are fully digitized; see http://gallica.bnf.fr/ark:/12148/btv1b85100240.r=Smith-Lesouëf%20232?rk=21459;2; and http://gallica.bnf.fr/ark:/12148/btv1b525066891.r=Smith-Lesouëf%20233?rk=21459;2 (accessed 09/01/2018). The latter album is discussed in the catalogue Indian Paintings, 46-51, cat. no. 1. For comparable covers, see Duncan Haldane, Islamic Bookbindings in the Victoria and Albert Museum (London: World of Islam Festival Trust in association with the Victoria and Albert Museum, 1983), 92-93, 177-178, 192, pls. 92, 166, fig. 27. I am referring to Ca. 112 and Smith-Lesouëf 233, both of which are intended to be viewed backwards. Conversely, Smith-Lesouëf 232 is meant to be viewed from front to back and each of its portraits faces a blank page with inscriptions identifying the figure. Ca. 112, Smith-Lesouëf 233 and Smith-Lesouëf 232 contain respectively 46, 47 and 29 portraits. The above-described arrangement is broadly maintained, though with some alterations, also in Golconda portrait series that present signs of having been manipulated after their arrival to Europe, among them two series in the British Museum, inv. nos. 1974,0617,0.2 and 1974,0617,0.4. Mark Zebrowski, Deccani Painting (Berkeley: University of California Press, 1983), 178-188. It is important to note, however, that Hashim did not execute these portraits from life but modeled them on preexisting Deccani portraits that have not survived. For further information, see Amina Okada, Imperial Mughal Painters: Indian Miniatures from the Sixteenth and Seventeenth Centuries (Paris: Flammarion, 1992), 148-152, figs. 174-177; Robert Skelton, “Documents for the Study of Painting at Bijapur in the Late Sixteenth and Early Seventeenth Centuries,” Arts Asiatiques 5 (1958), 97-125, esp. 103-104. See Michael Brand and Glenn D. Lowry, Akbar’s India: Art from the Mughal City of Victory (New York: Asia Society Galleries, 1985), 81-84, figs. 47-55. For a discussion of these methods, see Kapil Jariwala, “The Materials and Technique of Indian Painting,” in Rosemary Crill and Kapil Jariwala, eds., The Indian Portrait, 1560-1860 (London: National Portrait Gallery, 2010), 170-172. Only nine of the 74 subjects featured in the surviving series are shown in two alternate versions, indicating the use of two different templates (Becherini, “Staging the Foreign,” 180-182). Bronwen Wilson, The World in Venice: Print, the City, and Early Modern Identity (Toronto: University of Toronto Press, 2005), 70-132. This portrait is discussed in B. N. Goswamy and Caron Smith, Domains of Wonder: Selected Masterworks of Indian Painting (San Diego: San Diego Museum of Art, 2005), 170-171, cat. no. 68. A similar one is published in Kalpana Desai, Jewels on the Crescent: Masterpieces of the Chhatrapati Shivaji Maharaj Vastu Sangrahalaya formerly Prince of Wales Museum of Western India (Middletown: Mapin Publishing, 2002), 293, cat. no. 130. Syed Ali Asgar Bilgrami, Landmarks of the Deccan: A Comprehensive Guide to the Archaeological Remains of the City and Suburbs of Hyderabad (Delhi: Manas Publications, 1984), 63-65. Since most of the portraits within these series conform to a single prototype, the subjects are not shown as progressing through different stages of life or holding more than one official post. Rather, they appear frozen at one particular point in time, which tends to correspond with the peak of their career. Becherini, “Staging the Foreign,” 102-125, 182-183, 668-686. Zebrowski, Deccani Painting, 123-125, 193-194. Linda York Leach, Indian Miniature Paintings and Drawings: The Cleveland Museum of Art Catalogue of Oriental Art (Cleveland: Cleveland Museum of Art, 1986), v. 1, 91-93, cat. no. 26. On the importance of correspondence in shaping early modern European collecting trends, see Irene Baldriga, “The Role of Correspondence in the Transmission of Collecting Patterns in Seventeenth-century Europe: Models, Media and Main Characters,” in Robert Muchembled, ed., Cultural Exchange in Early Modern Europe (Cambridge: Cambridge University Press, 2006-07), v. 3, 187-216. Becherini, “Staging the Foreign,” 188-206, 719-726. BnF, Smith-Lesouëf 233, folio inserted at the end of the album. The auction catalogue of Witsen’s collection (1728) lists more than 450 miniatures, most of which do not survive. For information about this collection and an in-depth discussion of the Witsen album, see Scheurleer, “Witsenalbum,” 167-254. P. J. A. N. Rietbergen, “Witsen’s World: Nicolaas Witsen (1641-1717) between the Dutch East India Company and the Republic of Letters,” Itinerario 9 (1985), 121-34; Marion Peters, “From the Study of Nicolaes Witsen (1641-1717): His Life with Books and Manuscripts (with a Portrait and 7 Graphs),” Lias 21 (1994), 1-47, esp. 37-39. On de Bruijn and his Asian travels, see Jan de Hond, “Cornelis de Bruijn (1652-1726/27): A Dutch Painter in the East,” in Geet Jan van Gelder and Ed de Moor, eds., Eastward Bound: Dutch Ventures and Adventures in the Middle East (Amsterdam: Rodopoi, 1994), 51-81. Marion Peters, “Nicolaes Witsen and Gijsbert Cuper: Two Seventeenth-century Dutch Burgomasters and their Gordian Knot,” Lias 16:1 (1989), 137-141. Peters, “Nicolaes Witsen,” 137-39; De Hond, “Cornelis de Bruijn,” 63-66. R. W. Lightbown, “Oriental Art and the Orient in Late Renaissance and Baroque Italy,” Journal of the Warburg and Courtauld Institutes 32 (1969), 265-266. Antonio Vallisnieri, “Catalogo di alcune rarità, che il Sig. Abate Co. Giovannantonio Baldini ha riportate da’ suoi viaggi, venute principalmente dall’Indie e dalla Cina; indiritto al P. D. Piercaterino Zeno C.R.S. dal Sig. Antonio Vallisnieri, pubblico primario Professore di medicina teorica nello studio di Padova, con lettera data di Padova il dì terzo di novembre, 1719,” Giornale de’ Letterati d’Italia 33:2 (1722), 118-148. Vallisnieri, “Catalogo,” 130-37, cat. nos. 23-27, 30. See Baldriga, “The Role of Correspondence,” 187-216. See Becherini, “Staging the Foreign,” 206-222. Scheurleer, “Witsenalbum,” 198; Hermann Goetz, The Indian and Persian Miniature Paintings in the Rijks-prentenkabinet (Rijksmuseum) Amsterdam (Amsterdam: 1958), 31. Rijksprentenkabinet, RP-T-00-3186, stray folios kept within the album. Peters, “From the Study,” 31-33. Vallisnieri, “Catalogo,” 130-133; Antonio Vallisnieri, “Altra Lettera del Signor Antonio Vallisnieri al Padre D. Piercaterino Zeno, C.R.S. con cui mandagli il Catalogo de’ Re del Mogol, i ritratti de’ quali serbansi nel ricco museo del Co. Ab. Giovannantonio Baldini,” Supplementi al Giornale de’ Letterati d’Italia 3 (1726), 337-63, esp. 337-339. Baldini’s notations about the subjects of one of his lost portrait series, which were fully transcribed by Vallisnieri, contain specific references to the textual sources he consulted; see Vallisnieri, “Altra Lettera,” 346-362. Eric Cochrane, Historians and Historiography in the Italian Renaissance (Chicago: University of Chicago Press, 1981), 364. See Kees Zandvliet and Leonard Blussé, The Dutch Encounter with Asia, 1600-1950 (Amsterdam: Rijksmuseum, 2002), 13-14. See Arasaratnam, Merchants, 72; Gijs Kruijtzer, Xenophobia in Seventeenth-Century India (Leiden: Leiden University Press, 2009), 242-245. See Haroon Khan Sherwani, History of the Qutb Shāhī Dynasty (New Delhi: Munshiram Manoharlal Publishers, 1974), 702-03; Kruijtzer, Xenophobia, 76-77, 224. Daniel Havart, Op- en Ondergang van Cormandel… (Amsterdam: Jan ten Hoorn, 1693), opposite pp. 210, 214, 219, 220, 226; François Valentijn, Oud en Nieuw Oost-Indiën… (Dordrecth: J. van Braam, 1724-26), v. 4, part 2, 248. For another instance of the use of portraits from Golconda series as models for engravings to illustrate a contemporary Dutch publication, see Nicholaas Witsen, Noord en Oost Tartarye… (Amsterdam, 1692), 70-71, 222-223. On Daniel Havart, see Donald F. Lach, Asia in the Making of Europe (Chicago: University of Chicago Press, 1965-93), v. 3, book 2, 1079-1095; Scheurleer, “Witsenalbum,” 254. On François Valentijn, see Zandvliet and Blussé, The Dutch Encounter, 122-123. For a discussion of these genres, see Clough, “Italian Renaissance Portraiture,” 183-223; Wilson, The World in Venice, 186-255. Wilson, The World in Venice, 201. On the impact of the pseudo-science of physiognomy on the humanistic art theory of the Renaissance, see Édouard Pommier, Théories du Portrait: De la Renaissance aux Lumières (Paris: Gallimard, 1998), 112-116; Tommaso Casini, “La Questione Fisiognomica nei Libri di Ritratti e Biografie di Uomini Illustri del Secolo XVI,” in Alessandro Pontremoli, ed., Il Volto e gli Affetti: Fisiognomica ed Espressione nelle Arti del Rinascimento: Atti del Convegno di Studi, Torino, 28-29 Novembre 2001 (Firenze: L.S. Olschki, 2003), 103-117. Wilson, The World in Venice, 247-248. Francesco Sansovino, L’Historia di Casa Orsina (Venetia: Appresso Bernardino & Filippo Stagnini, 1565), part 2, 63. The work is discussed in Clough, “Italian Renaissance Portraiture,” 183-184. For specific examples, see Casini, “La Questione Fisiognomica,” 104-107; Francis Haskell, History and its Images: Art and the Interpretation of the Past (New Haven: Yale University Press, 1993), 41-59. Rosanna Pavoni, “Paolo Giovio, et son Musée de Portraits: À propos d’une exposition,” Gazette des Beaux-Arts, 6th series, 105 (1985), 114. Wilson, The World in Venice, 231-240. See Wilson, The World in Venice, 249-252. See Wilson, The World in Venice, 70-132. Wilson, The World in Venice, 71. Kristen Ina Grimes, “Dressing the World: Costume Books and Ornamental Cartography in the Age of Exploration,” in Elizabeth Rodini and Elissa B. Weaver, eds., A Well-Fashioned Image: Clothing and Costume in European Art, 1500-1850 (Chicago: David and Alfred Smart Museum of Art, 2002), 13-21. Already in Akbar’s times, portraiture was recognized as a powerful “antidote against the poison of ignorance,” as stated in the A’in-i Akbari; François Bernier, Travels in the Mogul Empire, A.D. 1656-1668, trans. Archibald Constable (Westminister: Constable, 1891), 255, fn. 1. 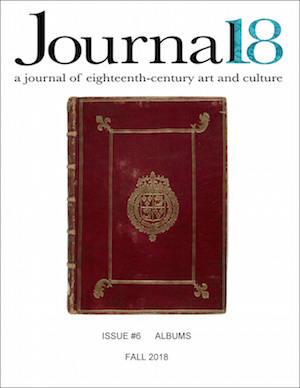 On Mughal dynastic portraiture, see Bianca Maria Alfieri, “I Ritratti di Timur nella Miniatura Moghul,” Oriente Moderno, Nuova serie, 76:2 (1996), 641-665; Corinne Lefèvre, “In the Name of the Fathers: Mughal Genealogical Strategies from Bābur to Shāh Jahān,” Religions of South Asia 5.1/2 (2011), 409-442. On dynastic portraiture at the Golconda court, see Pratapaditya Pal, Indian Painting: A Catalogue of the Los Angeles County Museum of Art Collection (Los Angeles: The Museum of Art, 1993), 335-39, cat. no. 103; M. A. Nayeem, The Heritage of the Qutb Shahis of Golconda and Hyderabad (Hyderabad: Hyderabad Publishers, 2006), 266-270. For examples, see J. P. Losty and Malini Roy, Mughal India: Art, Culture and Empire: Manuscripts and Paintings in the British Library (London: British Library, 2012), 159-160, fig. 102; Deborah Hutton, Art of the Court of Bijapur (Bloomington: Indiana University Press, 2006), 151, fig. 4.9. Crill and Jariwala, The Indian Portrait, 29-30, 88. Sir Thomas Roe, The Embassy of Sir Thomas Roe to the Court of the Great Mogul, 1615-1619, as Narrated in His Journal and Correspondence, ed. William Foster (London: Hakluyt Society, 1899), 143. David J. Roxburgh, “Concepts of the Portrait in the Islamic Lands, c. 1300-1600,” in Elizabeth Cropper, ed., Dialogues in Art History, from Mesopotamian to Modern: Readings for a New Century (Washington D.C.: National Gallery of Art, 2009), 118-137, esp. 120-124. Gülru Necipoǧlu, “The Serial Portraits of Ottoman Sultans in Comparative Perspective,” in Ayse Orbay, ed., The Sultan’s Portrait: Picturing the House of Osman (Istanbul: Isbank, 2000), 22-61. Emine Fetvacı, “From Print to Trace: An Ottoman Imperial Portrait Book and Its Western European Models,” The Art Bulletin 95:2 (2013), 243-268. James Clifford, Routes: Travel and Translation in the Late Twentieth Century (Cambridge: Harvard University Press, 1997); Finbarr Barry Flood, Objects of Translation: Material Culture and Medieval Hindu-Muslim Encounter (Princeton: Princeton University Press, 2009), 1-5; Fetvacı, “From Print to Trace,” 243-244.